On Friday in the High School division, Brooklyn High Jump champion My’khiyah Williams cleared 5’6” for the win. Williams holds both the Mid School record of 5’6 1/2” set in 2015, and the Elementary B record 4’9” set in 2012. In the 55 meters, Iantha Wright of St. John’s Prep in Queens ran her personal best race to take first in 7.10 just in front of Mariam Magassouba of Harry Truman in the Bronx who also ran her personal best clocking 7.12. Sophia Myers of Queens High School of Teaching continues undefeated in the 55 meter hurdles, improving a third straight week with her win in 8.22. Philadelphia’s Arianna Ruffin has shown remarkable improvement with a win in her personal best time of 25.87. Ruffin finished ninth in the 200 meters in the opening meet, then rose last week to a second place finish before this week’s victory. Coach Ken Abney, who has developed dozens of young athletes into some of the nation’s best young talent, has helped Ruffin grow from a naturally gifted athlete into a leading competitor. In distance races, New Jersey’s Athing Mu scored her third consecutive double win with a 59.03 performance in the 400M and 2:20.44 in the 800M; and Shayla Sanders of Young Women’s Leadership school in Queens remains undefeated in the 1500 meters (4:48.71). On Saturday in the Mid School Division, Lauren Princz of Fernwood MS in Egg Harbor Township continues to lead the 55 meters after a 7.26 finish, a repeat of her indoor track personal record. Tia Taylor remained undefeated in the 55 meter hurdles with her win in 8.41. The 8th grader from Egg Harbor Community School, N.J. is ranked the number one 13-year-old in the nation in the long jump and won two gold medals at the Junior Olympic Games in Houston this summer. Brianna Brown of Bronx Latin School, climbed back into first place with two of her best races this season, winning the 200 meters in 25.63 and 400 meters in 59.09. Marcia Ojo of Franklin Park, N.J. improved by more than 9 seconds over last week to win the 800 meters in 2:20.53 her new personal indoor record; and Lauren Heskin of Floral Park Memorial, Queens won the 1500 meters in 4:47.54. On Sunday in the Elementary A division Philadelphia’s Amirah Nesmith won the Elementary A 55 meters in 8.34, and in her best race of the season which also sets another personal best, won the 200 meters in 30.74. Da’mira Allen of Chester, Pa. continues undefeated after winning the 400 meters in 70.1 and the 800 meters in 2:36.57. In the Elementary B division, Avery Lewis won both the 55 meters (7.59) and 200 meters (27.34). Lewis, who holds Colgate Women’s Games’ records in both Elementary A and B divisions, continues to win in times at Pratt faster than most of her first place East Coast USATF Indoor championship competitions. The Colgate Women’s Games remain completely free as a means for all girls to develop their sense of personal achievement and self esteem in an atmosphere of friendly competition. The Colgate Games’ promote the importance of continued education and provide a training ground for those who might not otherwise participate in organized sports. Hopeful young track stars, parents and coaches can follow scores and find information at http://www.colgategames.com/. 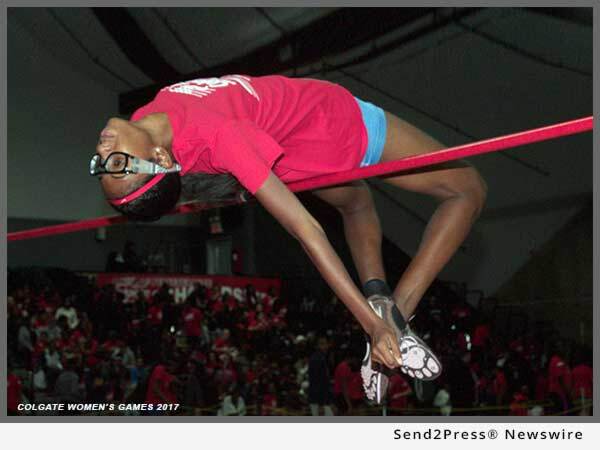 *Photo Caption: Brooklyn High Jump champion My’khiyah Williams cleared 5’6” for the win in the High School division of the 43rd Annual Colgate Women’s Games at Pratt Institute on Friday. Williams holds both the Mid School record of 5’6 ½” set in 2015, and the Elementary B record 4’9” set in 2012. Four preliminary meets and a semi-finals at Pratt Institute determine who will compete at the finals at The Armory, NYC in February for trophies and educational grants-in-aid from Colgate-Palmolive Company. Follow scores at colgategames.com. Top row left to right: 1. My’Khiya Williams; 2. Iantha Wright, et al; 3. Sophia Myers et al; 4. Shayla Sanders. Second row: 5. Lauren Princz et al; 6. Tia Taylor et al; 7. Lauren Heskin; 8.Brianna Brown; 9. Amirah Nesmith. Meet Director Cheryl Toussaint said, "While we're proud that the Colgate Women's Games showcase leading athletes, we're even more pleased to see so many girls of all abilities discovering and improving their talents."